DRA members Roger and Linda Svec operate a family farm near Estelline, SD. They have made a priority to provide healthy alternatives to the mass produced food often available at local supermarkets. They produce grass finished poultry (primarily chickens), lamb and beef. In addition to their dedication to farming responsibly, they have committed significant effort to living as efficiently as possible. Six years ago they started building their new home, learning as they went and only contracting out help when necessary. Being deeply involved in every process of building an energy efficient home has given them a unique perspective on what works, what doesn’t and what’s practical. I traveled to the Svec farm to speak with Roger and Linda about their home, and the following are questions I asked about their experiences and advice they might give to others looking to have a more efficient living space. DRA: Up to this point, what energy efficiency elements has your family installed in your home? Svecs: Since we started from the ground up a lot of efficiency materials were built into the structure. Super insulated panels [SIP] make up much of the outside skeleton of the building (see photo at left / click all to enlarge). 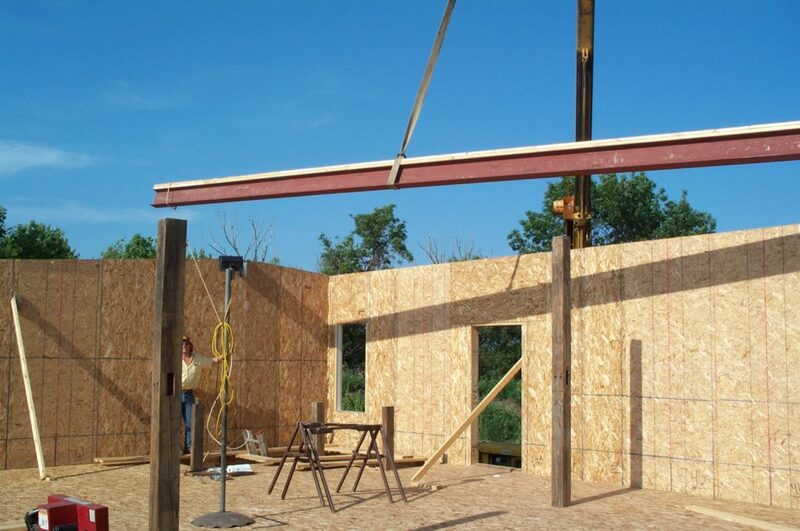 SIP’s come in large panels, prefabricated to the specific building’s measurements. When materials were needed to support heavier weights, such as below the garage, we used Fold Form thermal mass walls (see photos at right). Fold Form is a product that comes in two 1ft.X 4ft. sets of rectangular pieces made from a Styrofoam, that are held together with plastic ties; the product is available with an eight or twelve inch space between. These segments are stacked on top of each other, braced, rebar is installed in-between and concrete is then poured / pumped in. 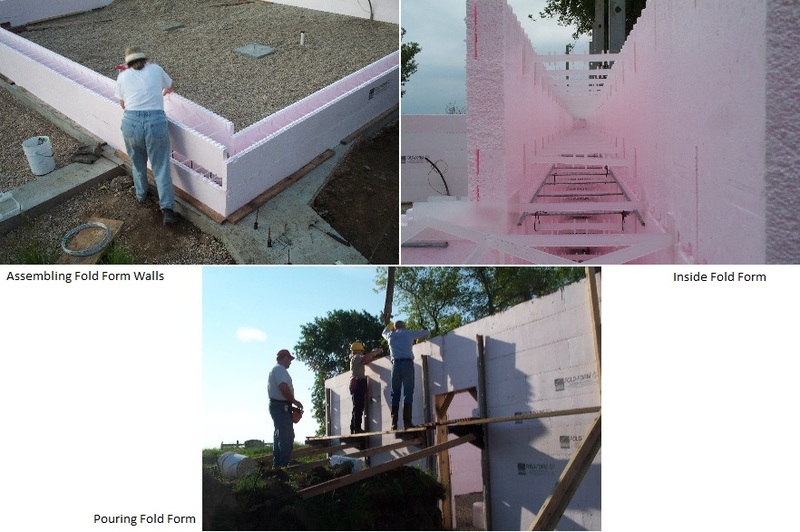 The “form” is left insulating the wall both inside and out. The plastic ties also provide a means of attaching wall coverings, such as sheet rock, paneling, etc. 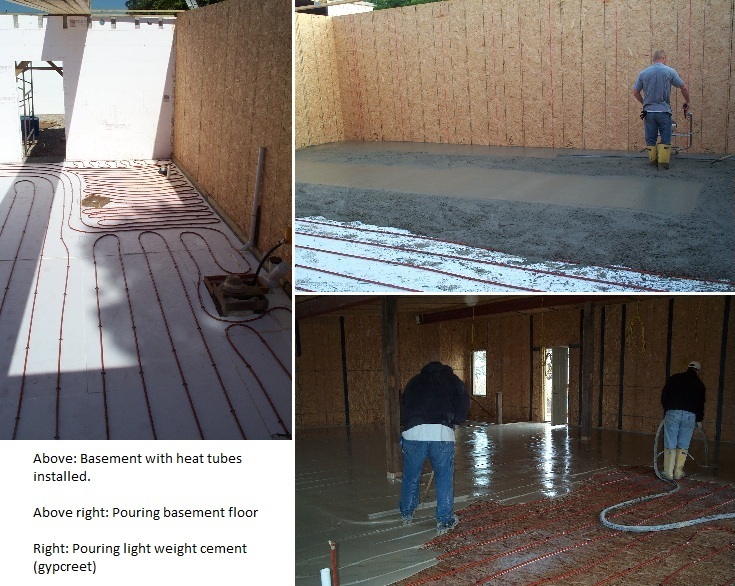 As the floors are heated with in-floor pex tubing, insulation was also installed under the floor before it was poured (see photos at left). Due to the amount of insulation and the in-floor heating, the basement doesn’t have the “basement” feel. The air tight construction methods and materials warranted the use an air exchanger or air handler. This device enables the climate controlled interior air to transfer some of its energy to the incoming fresh air. The air is then evenly distributed through the building using a traditional ducting system. A ground source heat pump is used to heat and cool the home (see photo at right). This means heat is drawn “pumped” from the thermal mass of the earth to heat the building, and heat is “pumped” out of the house to the earth to cool the building. This is accomplished by means of underground pipes containing an antifreeze solution. 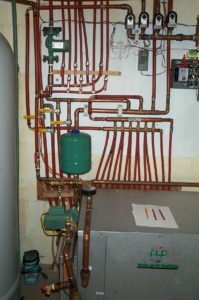 The design of the heat pump allows for excess heat produced during the heating season to be used to heat the domestic water, reducing the requirements of the water heater. Additionally a fractional horsepower water pump is used in the hot water circuit to provide nearly instant hot water at each faucet, reducing the amount of water used waiting for the water to get hot at the faucet. Timbers and other materials from a dismantled barn were used for support columns, interior load bearing walls, and the attached garage (see photo below). This saved on the cost of construction materials (if you don’t count the labor for salvaging the material), reused some excellent materials, and gives the interior a special character. DRA: A significant part of the construction was done by your family, how difficult has everything been? Svecs: Well when we started the project in 2005, in our first pour of cement we wrote ‘2005/2006’, since we thought it would surely not take more than another year to complete. It is now the summer of 2011, and although we are very comfortably living in the space there are several “finishing touches” yet to be accomplished. There have been many challenges, but as each one is met there is the satisfaction of solving the problem as a reward. The heat pump installation was perhaps one of the more elaborate challenges, as compared to say the clothes chute to the laundry room from the upstairs bathroom. You can see the heat pump, but not the laundry chute. DRA: What would you say are the pros and cons of a super-efficient home? Svecs: One of the definite pros of this home is the significant reduction in our heating and cooling bill. In our old, very inefficient house, heating and cooling costs averaged around $200. Our highest cost over the last year, with the heat pump system, was for heating in January for less than $90, while averaging $35 from May until September for cooling. The main con, as many people are aware of, is the upfront costs involved from using the latest technologies and materials. However within a matter of time, all the investments will be recouped, and in some cases there are cash incentives to use these new technologies. DRA: What was the main inspiration for your family to start this project? Svecs: The main reason was simply, we needed a new house. Our old house had very high energy bills due to inefficiencies, so when building our new home we wanted to use the best products available, within reason. DRA: Finally, would you encourage others to take on a similar project? If so, would you have any advice for them? Svecs: One-thing we learned is the importance, from the very beginning, to design the home with efficiencies in mind. An example from our home is all the water appliances are in one end of the building. This reduced the amount of plumbing required, and the number of things to work around such as air-conditioning ducting, wiring, etc. We also found there are a number of building companies that make prefabricated materials that are energy efficient and easy to install. The exterior walls took about a day per level to finish (under-ground, upper level, and roof sections).